For the past few weeks my husband and I have had to make frequent trips to Nairobi, the capital city of Kenya. The whole rolling stone effect began when we planned to visit our son in Canada. He has been there for nearly 8 years and we finally thought let’s go and visit him instead of us meeting up in India or UK as we have done for the past so many years. However, the process of applying for the visas has turned into a gruelling task. The Canadian High Commission called us for the medical examination at their appointed centre, two weeks after we had already made a trip to submit our applications. We spent a whole day there last week and we have to go again because the medical centre is not satisfied with the results. We have to go all the way back to Nairobi to repeat some of the tests. Don’t get me wrong, Nairobi is not really far compared to many cities in India or US, but its the time wasted, the cost of flights and medical tests and the frustration of just waiting forever for the procedures that barely take a few minutes. The worse part is that no medical test or examination done in Mombasa will be accepted by the Canadian High Commission and to think Mombasa is suppose to be the second largest city after Nairobi! So once again we travel tomorrow and I had to clear the fresh produces from the fridge as we maybe staying longer this time round. Yesterday’s lunch was an interesting salad put together with all that was in the fridge. Filling, satisfying and delicious is the comment I got from hubby dear. After I put the ingredients together, I thought, wow what a fantastic salad for big parties, take away lunches or even a picnic. Adding cheese to a salad always makes it more interesting and appealing. Try it out as the dressing also is a bit different from the usual vinaigrette. Cook the pasta in salted water till just done (al dente). Drain it out into a colander or sieve. Run cold water over it and place it in a big bowl. Wash and wipe the mushrooms with a clean cloth and cut it into quarters. Heat 1 tbsp of olive oil in a wide pan over medium heat. Add sliced garlic and stir fry it till it becomes light pink in colour. Add the mushrooms and turn up the heat. Stir fry the mushrooms for 2 minutes and remove it from the pan immediately. Let the mushrooms cool down. Sprinkle a pinch of salt over the cooked mushrooms and mix well. Peel and cut the avocado into chunks. Add lemon juice and mix gently. 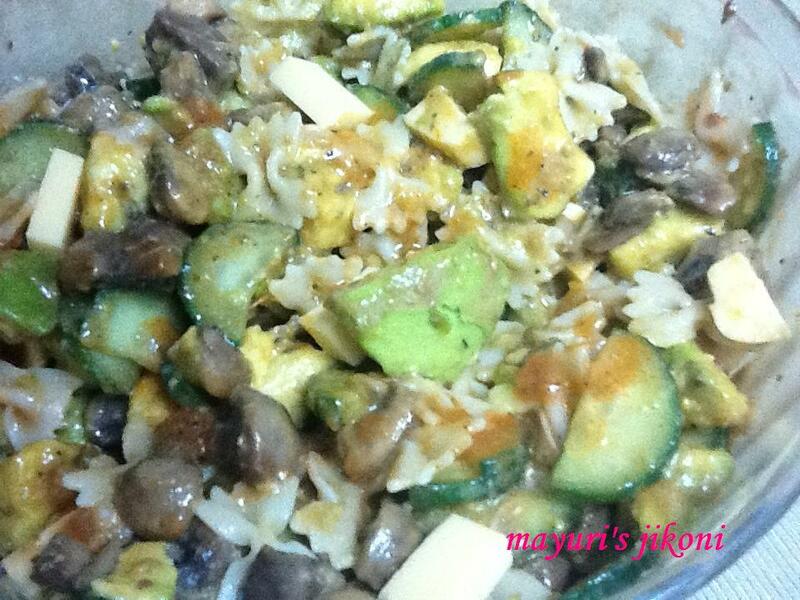 Add the mushrooms, avocado, cucumber and cheese to the pasta. Toss it. Add the oregano, tomato puree and let it cook for 2 to 3 minutes. Add salt, sugar, chilli flakes and pepper. Mix it well. Let the dressing cool down a bit before mixing it with the salad. Can prepare the salad ahead and add the dressing just before serving. As a take away lunch or for picnics, store the dressing in a separate container till required. Add lightly roasted pine nuts or walnuts if you like. Wash and cut tomatoes into chunks. Place it in a pan. Cover and let the tomatoes cook till they become soft. Let it cool for a bit and then liquidise in a blender. The fresh tomato puree is ready for use in curries, pastas, vegetables, dals etc.